Bluetooth amplification at your fingertips! This new system is called The "UCON-BT" and is the prefect system for the tech savvy music listener that wants bare-bones Bluetooth / Cellphone music storage and or streaming delivery. The UCON is our new for 2019 Sub-Compact Console that has earned it's name of being so Universal in design we had to call it, "Universal Console". This model is our newest addition to the UCON family and features an internal D-Class 100 watt amplifier with Bluetooth modular interface. Simply put all you have to do is turn the unit "ON", listen to the cool tone that let's you know all is ready, and pair it to your phone, all without the need of time consuming codes, it's fast and easy. What is a D-Class amplifier? In our case we are using a high quality circuit board that uses Mosfet efficient power output. This type of output means more and cleaner power to the speakers. The designer and manufacture of this amplifier added a Bluetooth circuit so your phone becomes the source for the music and the console is the delivery system. All of the music related controls are now in your hand and don so from your cellphone. For instance, you can stream or play from stored files with nothing more than volume control from your cellphone, or you can download one or more of many Equalizer Apps and then have an array of sound control at your fingertips. You can increase Bass, Mid's, and Treble, you can add effects, all depending on the Apps capability. One thing for sure, you can make your music sound what is best for your hearing pleasure. More features include a Master Power Switch, Master Fuse, 2 X Bright white LED Cab lights, w/ switch, and a 12 volt outlet to keep your phone charged while in your UTV. On of the coolest features we added was a push-button "Mute" so if you need to talk with someone you can simply reach up, push the button and your system will go into mute mode without unpairing the cell phone to the Bluetooth function, yes we have thought of everything, after all we too ride our UTV's just like you. 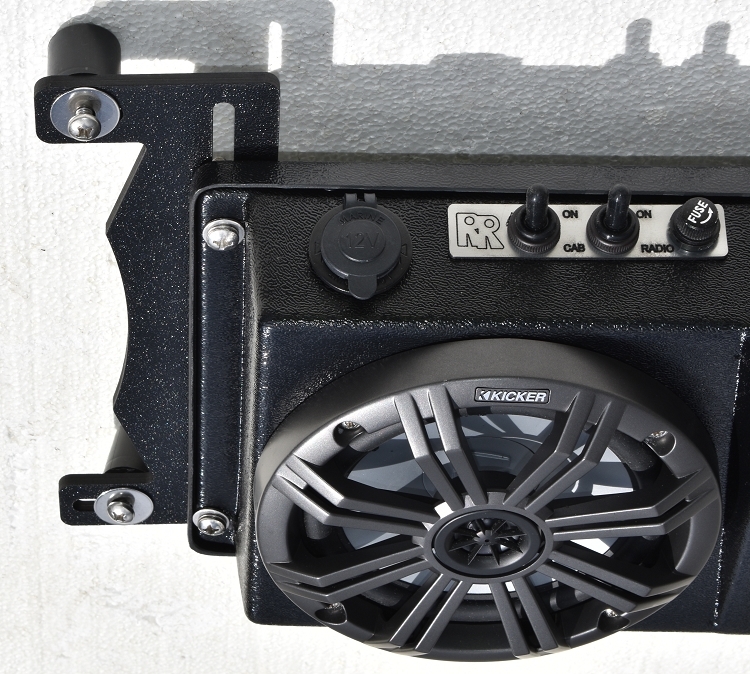 The UCON-BT is one if not the most compact Overhead Console on the market that features full size 6, 1/2" speakers. Not just any speakers, we chose the popular KICKER marine coaxials, they are waterproof, loud, and , clear! I almost forgot the best features on the UCON-BT! We designed a "pressure-point" secured area to hold not one, but two Cellphones while you are riding! This design will fit 95% of cell phones on the market with or without a exo-case, and has soft rubber pads so no damage is done while in storage. Since most people use outer cases we have set the factory standards for this use, however to use with a cellphone without a case, we having included additional adhesive padding, simply remove the 6 screws peel the protective paper and stick over top of the existing padding. The dash board clearly identifies all of the waterproof switch gear, and adds to the professional quality of it's design. We currently manufacture mounting kits for virtually all Side-By-Sides and manufactures, and design and manufacture more as needed. Give us a call and let us know what make and model you have and we will have a kit that will enable to mount the UCON-BT on your UTV or Golf Cart. The UCON-BT comes assembled and tested and requires only a 12 volt power supply (vehicles 12 volt battery). Mounting kits are generally roll bar mounted for most all side-by-sides, UTV's, and roof mounting kits are also available for Golf Carts or even flat metal custom roofs. There is an additional charge for mounting kits (vehicle specific), ranging in price from, $14.95 - $29.95. Mounting kits are a combination of machined aluminum, molded plastics, or machined plastics. Our mounting kits are said to be the best designs in the industry. IMPORTANT NOTICE: The mount kits shown are for reference only, (NOT INCLUDED) and in this case they are known as our universal roof mounting kit for Golf Carts and or flat type custom roofs. We offer a full line of vehicle specific mount kits and you MUST choose the correct mount kit for your make and model during check-out. SEE OPTIONS. If you are not sure or you do not see the mount for your vehicle, contact us and we will be happy to help. We are available M-F 10:00-5:30 Est. (863) 699-1812 and or you can find us on our company fb page; Rockin radios. You can also leave us a detailed message at the time of check out and we will contact you before we ship your unit.